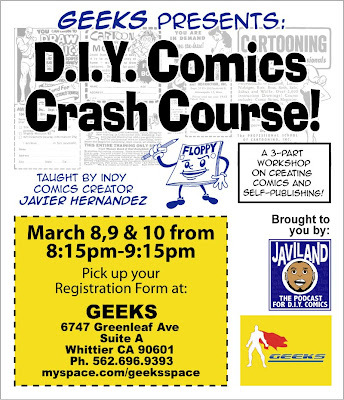 DIY COMICS CRASH COURSE coming to GEEKS comics in Whittier! If you've wanted to self-publish your own comic books but weren't sure where to begin, consider taking my new class, "DIY COMICS CRASH COURSE", at GEEKS comic shop this coming March. This 3-part class is an expanded series taken from my "DIY COMICS: The Secrets of Self-Publishing" seminars (which I've given previously at GEEKS and the Portland Comic Convention). In the CRASH COURSE, you'll learn about strategies to prepare you for self-publishing your comic book, as well as learning about the many available resources you should use to promote and build your brand name. I started publishing my own comics in 1998, and since then I've learned quite a lot about branding my art, and myself as an artist, that I had not even imagined before I started publishing. My goal for the class is to share these insights with you and educate you on the many pitfalls of the difficult road to self-published comics. We're not going to be drawing or writing a comic book in the class, but we will discuss elements of storytelling, particularly how, ultimately, it's your personal voice that you're really selling to people. My overriding theme in doing my own comics over the years has been the complete freedom in following my own ambitions. Since starting in 1998, I've sold my comics through comic shops, specialty bookstores, comic conventions, book festivals, art galleries, the internet and other venues. We'll discuss how to do that by working with others, as well as relying on yourself. Japanese monster RODAN made me an artist! I was writing a bio and artist statement for an upcoming solo art show I have in San Francisco this April (more on that in an upcoming post). In writing about my art and influences, I recounted the story about how in elementary school I had a particular moment when I decided I was 'an artist'! 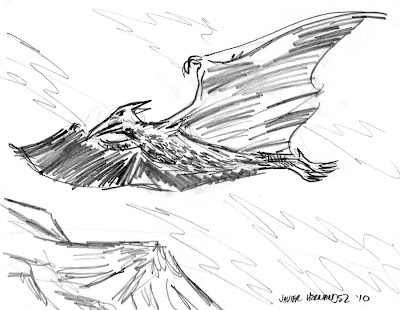 Over the weekend, I had watched 'RODAN', the 1956 Japanese monster movie with the giant, flying pterodon-type monster. Back then, in the fabled 1970s, we had a nice, simple 7 television stations to choose from, unless of course you counted the various channels available on the ultra-cool UHF dial (look that one up, you young whippersnappers!). Godzilla movies were regular staples back then, but for some reason the Rodan movie really made enough of an impression on me that when I went back to school during the week, and we had our regular art period, I drew Rodan. I remember the other kids in the class gathering by my table, one by one, just admiring the fact that I drew it. No way to know why that image caught their eyes, or if indeed it was the first time anyone in our group had drawn something so 'cool'. All I know is that I remember thinking how awesome it felt to draw something that elicited such genuine approval from people! The young boy had discovered his ego....and thus was born a new artist! Back to the present: So after I wrote and sent off my bio and artist statement, I remembered I had a DVD double feature, and one of the movies on there was RODAN! It's funny, but I originally bought that DVD because I wanted to see THE WAR OF THE GARGANTUAS, another childhood favorite. But I had never actually watched the Rodan movie on the DVD. The other night I popped in the DVD and watched, for the first time in about 35 years, RODAN! I am amazed at how well that film was made, the inventiveness on display regarding the model work and special effects, and the often imaginative editing. Turns out there were two Rodans in the movie, fancy that! Granted, I'm an adult watching a monster movie made back in the 50s, but I still enjoy watching entertaining flicks made in the past without comparing them with how films are made now. This morning I woke up thinking that I had to try my hand at drawing ol' Rodan once again, decades after I had last drawn him/her/it. The first sketch here is drawn from looking at pic on the web. I was looking for another image to draw when I realized that as a child, I drew him entirely from memory! No Google, no internet, no photo reference! 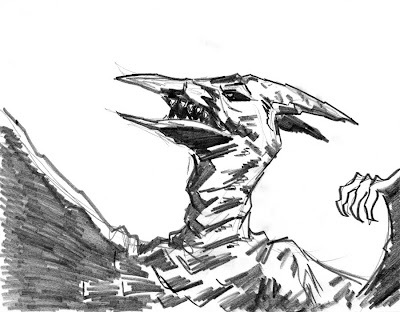 So I shut my browser and just drew Rodan from scratch. While there is no way to remember what my original drawing looked like, I'm pretty sure I drew him flying, so that's one thing the drawings would have in common. I'm sure that I was drawing before I created the Rodan artwork in my class. My older brother Albert, besides giving me his collection of comics in the early 70s, also influenced me to start drawing because he used to draw these really cool stylized baseball and football cartoon characters. But there was something special that day in the 2nd grade (or maybe 3rd grade?) when I realized that drawing, besides being very fun for me to do on my own, was allowing me to leave an impression on people, and get some nice accolades in the process! How's that for an artist statement?! This Saturday, Feb. 13, at GEEKS Comics in Whittier, I'll be conducting my free seminar, DIY COMICS: THE SECRETS OF SELF-PUBLISHING. The talk starts at 2 pm. 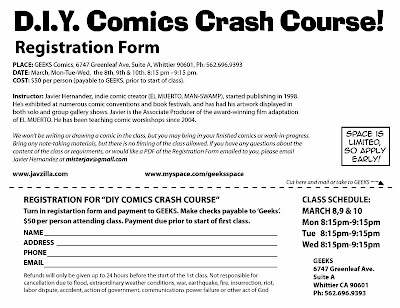 During the seminar, we'll be announcing the brand new DIY COMICS CRASH COURSE I'll be teaching there in March! 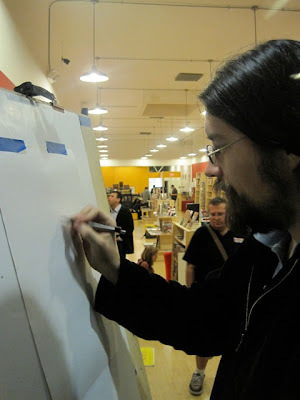 I've conducted my free DIY COMICS: THE SECRETS OF SELF-PUBLISHING previously at GEEKS as well as at the 2009 PORTLAND COMIC BOOK SHOW, each time receiving an enthusiastic response. Folks want to make their own comics, and that's great. I'll be sharing things I've learned over my 12 years since publishing my first comics. 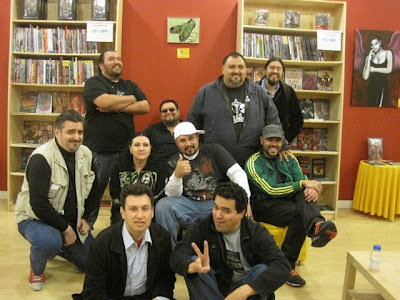 This past Saturday night at GEEKS Comics I was part of the Cartoonista contingent participating in SALABRATION. 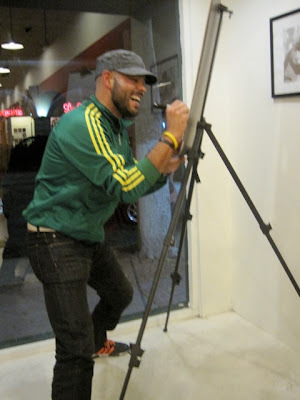 Jose Cabrera, creator of the CRYING MACHO MAN webcomic, demonstrates the upcoming Olympic sport, power cartooning! Lounging around and talking shop (or are they planning to break away and form a rival Cartoonista group??) are Mr. Geo Brawn (top left), Luis Escobar (top right), Grasiela Rodriguez (bottom left) and Jose. 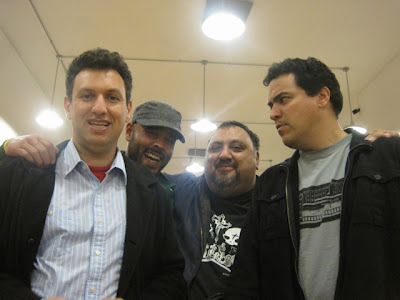 From left to right: Michael Aushenker, Jose, me and Jim Lujan. Michael and Jose will be having a two-man art show/book signing at GEEKS in the Fall, to coincide with a revamped CARTOON FLOPHOUSE brand. 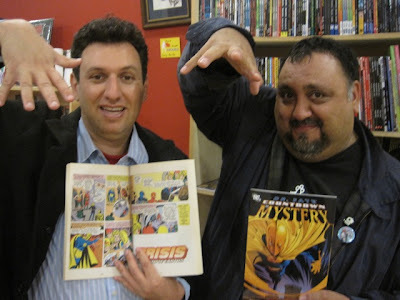 Michael and me throwing out some Dr. Fate-style mystic energy. Michael and I were discussing Dr. Fate's recent appearance on SMALLVILLE, and browsed some Dr. Fate comics at the shop. Grasiela Rodriguez, the Queen of the Cartoonistas, and the equally royal Hortencia Aguirre, wife of Cartoonista Raul Aguirre. Hortencia is an artist in her own right, and she's been nice enough to feed our hungry maws numerous times with her exquisite cooking. Luis Escobar doodles inside the front window display at GEEKS. Think of Amsterdam's Red Light District, but with cartoonists and sanitized! And sure to be a valuable artifact one day, Jimmy sparked the idea for a group jam session. 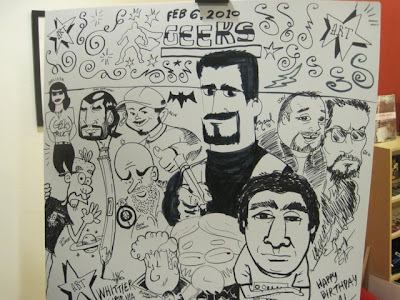 Besides a plethora of Cartoonistas, we had some special guests contribute to the drawing, such as Steve Sievers and my ol' pal Lalo Alcaraz (LA CUCARACHA). A long-time fan of mine happened to be walking past Geeks with his girlfriend when he noticed all the commotion inside. His name's Jason and I first met him back in 1998 when he made a beeline to my table in the Small Press area of the San Diego Comic-Con. He pulled his backpack off his back, pulling out a comic book and told me "I was hoping you'd be here!" and asked me to sign my then-recent EL MUERTO comic book, the photo-copied first edition. That moment had always meant a lot to me as a creator, because as a fan myself I had attended plenty of conventions where I was always hoping that one of my favorite artists would be in attendance. At the time we met back in 19989, Jason was a teenaged kid, and to think all these years later, he's all grown-up and I'm still making comics! 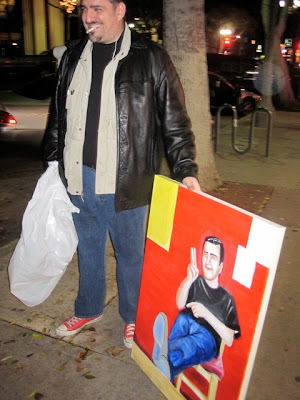 He picked up all my latest books and the DVD, and I even gave him one of the live art pieces I did that night. He's had his Muerto skull tattoo for about 10 years now! 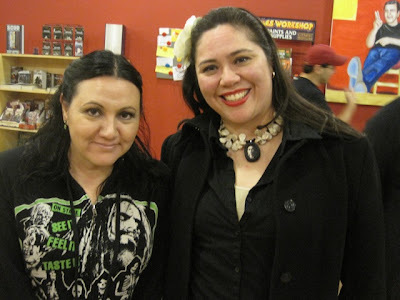 Back in 2006, I had invited Jason and his girlfriend to an early screening of the EL MUERTO movie, and I was glad to be able to do that for them. It's so great to have long-time fans like that! To say that Sal was impressed and flabbergasted to accept it would be a corker of an understatement! Raul really put a lot into this, and it really summed up the evening for everyone. By 12:30am, everyone had left. Sal couldn't have been happier. All of us Cartoonistas had a wonderful time, and so did the folks who stopped by to join in the fun. 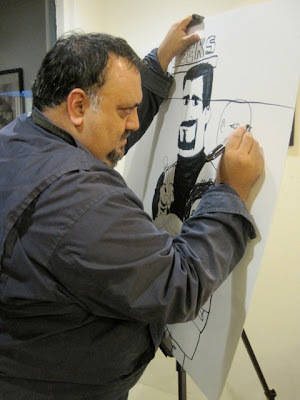 Over the last several years, either solo or with the Cartoonistas, I have done some truly memorable events with Sal. 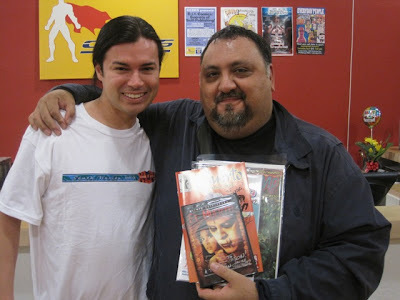 He hosted the Q&A for the EL MUERTO screening during the Whittier Film Festival, my nephew and I had a two-man art show, I've conducted my "DIY Comics:The Secrets of Self-Publishing" seminar there (and in fact will be doing another one this coming Saturday). It's so nice to be able to have a 'home' store that you can partner with for events like this, and make a good friend in the process. Thanks Sal, and Happy Birthday! The great line-up of talent that night: (Top row, left to right) John Narcomey, Geo Brawn, Javier Hernandez, Luis Escobar,(Middle row, left to right) Raul Aguirre, Grasiela Rodriguez, Rene (guest for the evening), Jose Cabrera, (Bottom row, left to right) Michael Aushenker and Jim Lujan. All photos courtesy Jim Lujan Photography, LLC! Order my comics & books here! Parents, librarians and teachers, click on the image for info! I'm a DIY cartoonist, creator of such comics as EL MUERTO, MANIAC PRIEST and WEAPON TEX-MEX, which I publish under my own imprint, LOS COMEX. 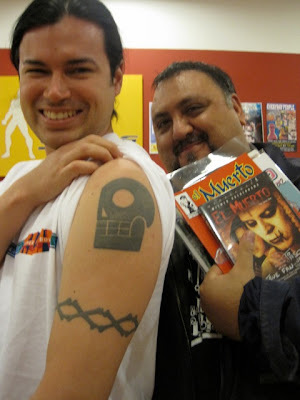 I'm also the Associate Producer of the award-winning El Muerto live-action film adaptation and in 2011 I co-founded the LATINO COMICS EXPO, the nation's first convention dedicated to spotlighting Latino creators. I teach comic book workshops throughout Los Angeles in schools and libraries. Follow JAVZILLA like these fine folks! Read Manga Muerto online for free! Print interview with RELEVANT magazine. I was interviewed on TALK OBJECTIVISM, but I talked more about comic creator STEVE DITKO! Podcast interview with Sci-Fi Talk. Lot of discussion on EL MUERTO film. 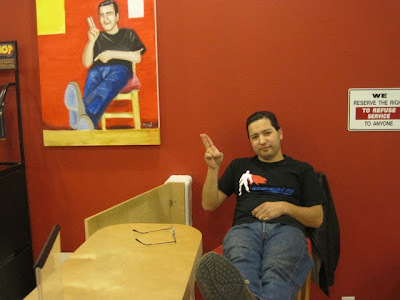 Podcast interview with Samuel Vera. Lotsa talk about being an independent creator!